Marie of Humblebee & Me makes her own, natural soaps. And she uses natural ingredients to color her soaps. If you look at the ingredient list of some commercial “natural” soaps you’ll find that they often use artificial, petroleum-based colorants which can be toxic. 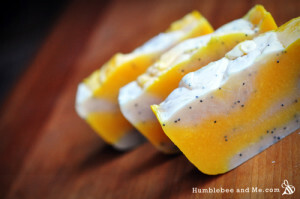 In this post Marie shares 8 different natural ways to color soap. There are some beautiful photographs of different soaps. Some of the color combinations are stunning! Click on the 8 Ways to Naturally Color Soap link below to see the complete article.